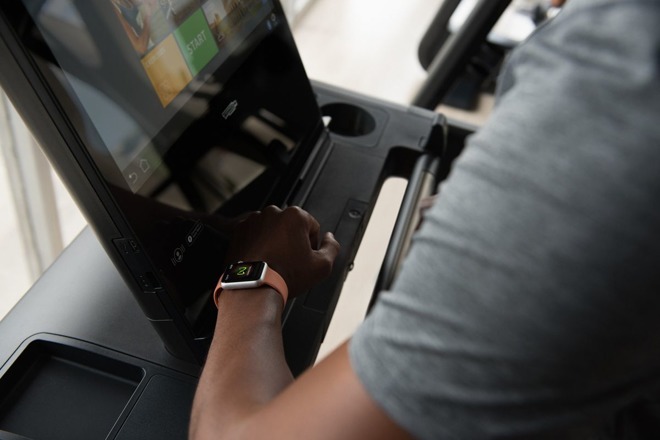 GymKit —the technology that allows two-way sync between an Apple Watch and compatible cardio machines —made its London debut this week at a Virgin Active gym near Mansion House, where Apple's director of fitness for health technologies, Jay Blahnik, was on hand for a press demonstration. The Virgin facility is equipped with machines by TechnoGym, one of several brands backing GymKit, according to Metro. Others include Matrix, Life Fitness, Cybex, Star Trac, StairMaster, and Schwinn. Apple is reportedly working with over 80 percent of the companies that make potentially compatible hardware. While gyms will in some cases need to buy entirely new machines, the company says that existing ones made "relatively recently" can be upgraded at a lower cost. GymKit was introduced alongside watchOS 4.1 towards the end of October, but made its first gym appearance this November in Australia, where Blahnik was also present for the media. GymKit performs two-way sync of data such as distance, speed, weight, floors climbed, heart rate, and estimated calories burned. Users begin by pairing their Watch with a machine via NFC, and once a workout is complete, the data is saved on the Watch but wiped on the machine. This integration allows more precise tracking of indoor cardio, since a Watch might not be able to account for things like treadmill incline, while a machine might not have access to things like accurate heart rate.